The Cirqula collection from Mepal has been designed specifically for a complete 'circle of use'. 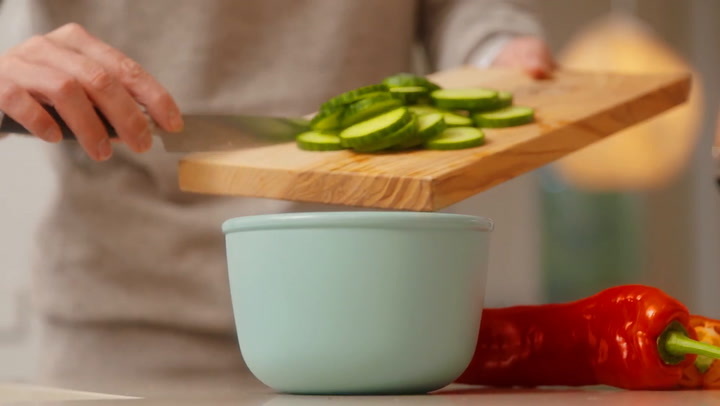 The food in these bowls can be stored in the freezer or fridge, heated up in the microwave (without the lid) and can then be served directly at the table. The Cirqula is made of indestructible material and the transparent window in the lid allows you to see the contents of the bowl clearly. The innovative, flexible lid is 100% airtight and leak proof. The food will therefore stay fresh longer and can be kept in the bowls and taken along when you are on the go. The Cirqula bowls are practical and easy to store away because they can be stacked when they are filled and nestled together when they are empty. View more from Food Containers & Savers, Mepal Storage. Never knew how happy designer food containers would make me! I have 4 of these in various sizes. They are great quality and look great so you can use them as serving bowls. Not only are these totally leak-proof, they're so pretty that there's no need to be embarassed by your work lunch. The window on the lid is great as you can see which lunch you're grabbing (useful when one of your family eats meat and the other doesn't!). Does everything it promises and is fantastic quality.